Who wants to be listed as the Number 1 link in the Google search engine results pages (SERPs)? (I assume you all do; otherwise, why are you reading this blog?) We all invest lots of time and money to achieve this often elusive goal. But why? The theory is that you typically get a dramatically higher click-through rate (CTR) in position 1 compared to links in lesser positions. At least, that is the common perception. Given all of the above, the applicability of the data is even less clear. No one disputes that position 1 on page 1 is the coveted spot in the SERPs. Furthermore, after position 1, the CTR of the lesser page positions steadily decline in value, although the CTR differentiation between positions flattens out as you go down the line. These declining numbers define the now famous SERP CTR Curve. (Of course, occupying the top position only has business value if you actually convert the visitors who come to your page, but that’s another post — or book, to be honest). What is in dispute is exactly how valuable the top position is from the other positions in the SERP. Note that we are specifically talking about page 1 of the SERP. 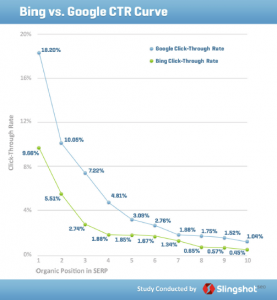 The CTR Curve of lower pages is far more volatile. But how dramatic is the CTR boost for a position 1 listing? As in everything in life, it depends. So let’s look at a tale of two CTR studies and see how they compare. We’ll examine SERP positions, their associated average CTRs, and then we’ll review the various other factors that should also be considered as you fret about either earning or keeping your top-ranking position in the Google SERPs. It’s clear that attaining the top position in the SERPs of either Bing or Google offers you the best opportunity to get visitors to your site. It’s also clear that if you don’t make it into the first list of ten blue links on Page 1, then not only is it hard to get clicks from search, things are largely up for grabs, CTR-wise, regardless of position (per the Optify study; Slingshot SEO did not publish CTR numbers beyond position 10). 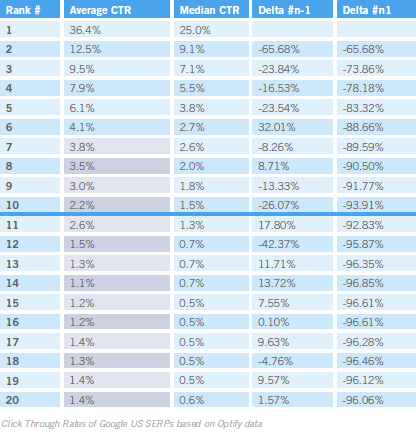 Indeed, per the Optify study, the top link on Page 2, the Number 11 spot, is actually a more valuable position in terms of CTR than Number 10, the last spot on the first SERP page (but just barely). Additionally, when searchers actually make it past Page 1 of the SERP (which is not often), then the specific position of a blue link on Page 2 is much less critical for CTR. For example, position 14 appears to be the least effective spot, on average, in the list! 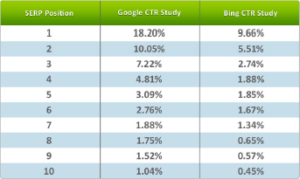 What’s different between the studies is how high the CTR is per rank position in Google (Bing was not addressed in the Optify study). 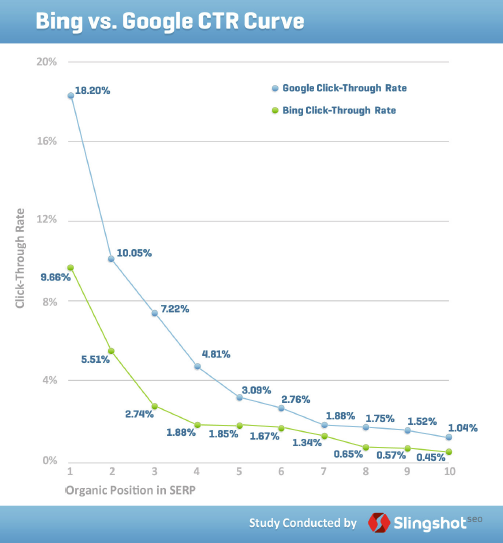 Slingshot SEO, whose study demonstrated a surprisingly low CTR rate across the board, was done after the Optify study. They speculated the reasons for their different data (which also contradicts many earlier CTR studies, including the now famous 2006 AOL data leak study) was based on factors such as non-holiday timing (that may have affected the Optify study), blended searches, algorithm updates, user interface changes, the growing influence of mobile search, and social media. Both studies posited that the richer SERPs of today are to some degree peeling off clicks from the organic results. New options such as “Related searches” in the Bing sidebar, PPC search ads, query refinements, instant answers, and media content from blended searches are likely negatively affecting the CTR for organic SERP traffic. There are many other, additional CTR factors in the Google SERPs that have been identified. For example, according to a whitepaper published this year by SEO Effect, if a blue link is tagged with a Google +1 button (you have to be logged in to a Google account to see it), it receives an increased number of clicks, regardless of where the link falls in the SERP list. This is likely due to the higher level of trust engendered by the social +1 endorsement. To further cement that concept, if the people who clicked the +1 button for a link are in your Google +1 social circles, you’ll also see their names in the SERP listing with that link. Regardless of how Google ranks the link, your friends think it’s worthwhile, and that is a powerfully compelling instigator of social trust. Which link would you click first? A recent study by Distilled (and published in the SEOmoz blog) about the power of Wikipedia as a brand showed why they are often near the top, if not the very top, ranked site for informational queries. The study revealed that SERP results pointing to Wikipedia.org often command their own very high level of CTR, even when they are not ranked #1 for a query. If your site is competing against a Wikipedia page for SERP traffic, you’ll likely have a built-in handicap. That said, another interesting element of the Wikipedia Effect is the coattails result it has. When a Wikipedia link is not in the position 1 spot, its lower placement in the SERP also draws higher levels of searcher attention (as well as their clicks) to other, lower position links near it. The same study referenced above by Distilled also delved into how much a well-written snippet mattered for clicks. (The snippet is the descriptive text shown beneath the blue link in a SERP, commonly derived from the page’sdescription tag.) The study author admitted he anticipated a large, clearly identifiable difference. His testing, however, only showed a very modest difference between a well-written snippet and one algorithmically created by Google when nodescription tag existed. He did say, however, that his testing was based on the responses of a largely overseas audience (Mechanical Turk) to a product for which they may have no familiarity. He said that an overtly sales-oriented snippet did not perform well for informational queries (at least with his international test audience), which indicates the audience was reading and assessing the value and relevance of the snippet text. Indeed, the fact that a large majority of searchers, on average, do NOT click the top listing in the SERP demonstrates the value of this content. 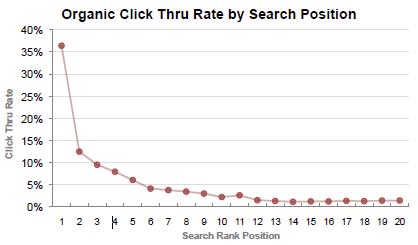 The adjacent link CTR lift from the Wikipedia Effect further solidifies this position. If page metadata was not relevant to searchers, the top ranking link in a SERP would take a far greater number of clicks. Searchers would have no way to evaluate the relevance of a link, and would simply trust Google’s judgment on the matter. But clearly they are more often than not doing some level of refinement of the SERP list when choosing a link to click. Whether or not a Wikipedia link is listed in the same Google SERP’s 10 blue links. If so, this link, regardless of position, will draw an inordinately higher amount of clicks just because it is Wikipedia. But if it is not in position 1, the weight of its draw also brings attention to the other, adjacent links in the page. Whether or not links in the Google SERP are tagged with +1 buttons. If the searcher is logged in to Google, and +1 tagged links exist in the SERP, they will draw a higher level of clicks than the average for the link’s SERP position. This +1 lift is likely amplified when users in the searcher’s Google +1 social circles have added their +1 vote to a link, as their names will also appear in the SERP). If a snippet (and title) is written in relevant, descriptive, and compelling language. If so, a majority of searchers will read and favor lower ranked links in their pursuit for relevance. Good review Rick. I’d like to caution people that are tempted to use these curves to estimate opportunity – prepare to be sorely disappointed if you use them as-is. I fully agree with you and I see that the adsense heatmaps are still contradicting what Google is saying about ads above the fold. I asked a Adsense Googler last year about Panda and hints from Matt Cutts about ads above the fold and that what she was saying is wrong and she did not even know what Panda was. will have impact on SEO Ranking Factors. What no one seems to be addressing is the local results that can show on a SERP in the case of local businesses. For example, my website (http://www.RoofRinseRun.com) lists at #4 in the organic section, but #1 in the local listings. There are seven local listings, and they are posted between organic results #3 & #4. How many people searching for a local business might skip all the organic listings and go for the first local listing?? That would be an interesting study. Brad’s right above – local search has made a huge dent in how organic search results show up. My site (http://straubcreative.nationbuilder.com) shows up 7th for buffalo ny web design but something like 10th in local depending on where you are in the city. The CTR / metrics year to year have been changing any way – any suggestions for authoritative sources on this besides IMN?